This fantastic split page book allows the reader to mix and match different combinations of fairy tales with hilarious results. What would happen if Goldilocks had two horrid stepsisters and fell asleep for a hundred years? Would she be woken by a hungry wolf or Little Red Riding Hood’s Granny? Mixing Up Fairytales is so much fun. They all have a beginning, a middle and an end so I thought it would be hilarious to find out what would happen if Cinderella climbed a beanstalk or Snow White married baby bear's bowl of porridge! So many children have hours of fun with this book and it's great for long car journeys. This is a fantastic book which the children in my class (Year 2/3) find absolutely hilarious! They've even started squabbling over who gets it at reading time! It's also a great resource to help encourage those less keen readers. 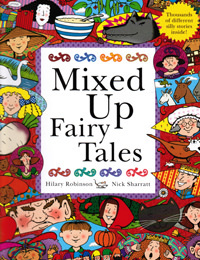 Hilary Robinson's 'Magical Mix-Ups' has also just arrived which is another great hit with the children.